...to have a Finished Object this week so I'd have something to show for a whole week passing. If you're wondering what I'll do with it, check out my Spring/Easter Pinterest board for clues. PS Check out the final blogiversary giveaway - there's one week to enter! Edited: I'm linking in with Suzanne's Crafty Easter party! Oh, so cute! Are you going to make lots? Cute! I keep meaning to make a rainbow of eggs. Just need to find the polystyrene eggs I bought a couple of years ago. 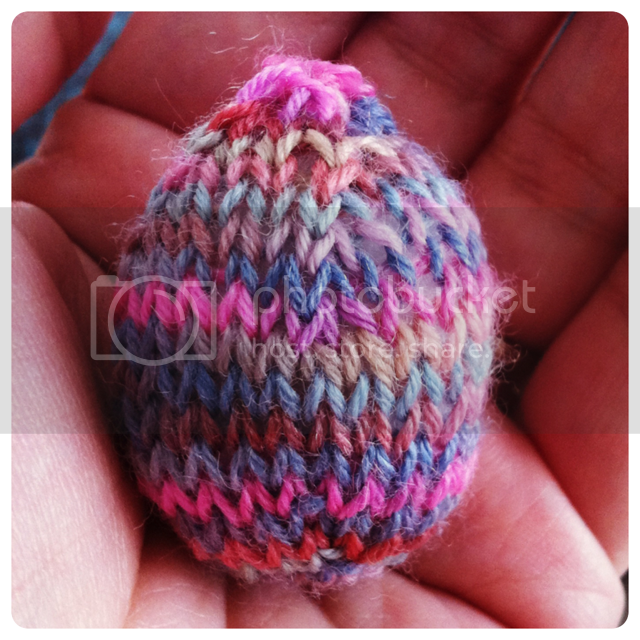 Cute :) I want to get started on some Easter Crafts, in particular knitted eggs and I may just be able to make one of these a day around the new baby! I'm not finding the time for any other knitting ATM. Awe, so cute. Perfect for some instant gratification! Nooooooo way!! I made the exact same thing yesterday!!! Same pattern, different yarn. They are cute huh? I think I know what you want to do with them, but I'll keep it a little secret, ssssssssssssssh. I'm writting a post about my Easter plans this weekend. It will be such fun! Lovely . Ive started knitting again, so many things to make so little time. You inspire me. Thank you for your kind words on Facebook etc.